Wanlov the Kubolor and his singing partner M3nsa, who together make up Foes of Kwame Nkrumah (FOKN) Bois, have shaved off their Rasta. “M3nsa and I were in Nima the other time and we decided just to walk into a barber’s shop. Upon entry, we just told the barber to shave off the Rasta,” Wanlov told NEWS-ONE in an exclusive interview. The controversial singers, known for their unique pidgin lyrics and the humor they attach to their music, have shaved off a great amount of hair which could easily pass for a good ‘Brazilian Wig’ on any day. (in the news for publicly engaging in a fierce man-to-man fight with radio presenter Blakk Rasta at the premises of Joy FM. According to the FOKN Bois, who will be showing the second installment of their ‘Coz Ov Moni’ movie in London today, the hair shaving was a spontaneous incident which has no connection with any recent happenings. 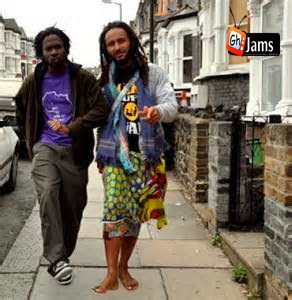 “M3nsa shaved his Rasta completely but I shaved off only some parts of mine,” Wanlov said. Wanlov and M3nsa have been receiving bashing from some Rastafarian groups in Ghana for leaking their naked picture on social platforms and their comments on gay issues among others.